Hassani usually uses the same woman character with closed eyes and without a mouth as symbols of the challenges faced by women in Afghanistan. 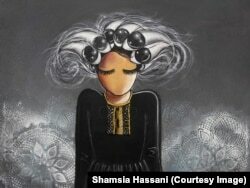 Shamsia Hassani says that in Kabul she generally has only a few hours to complete her work because of the dangers. In Istanbul she had three days to complete this mural. Dorian Jones reported this story for VOA News. Caty Weaver adapted it for Learning English. Hai Do was the editor. graffiti -- n. pictures or words painted or drawn on a wall, building, etc.